Over the past two weeks, the Frankfurt Motor Show (Internationale Automobilausstellung -IAA) has been taking place at the Frankfurt Fair and Exhibition Centre and we have been discovering, amongst the many splendid cars, attractive hostesses and exciting car accessories all sorts and kinds of technical textile too. 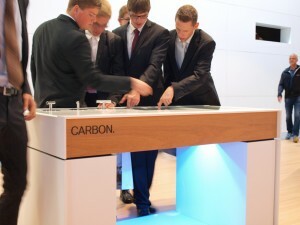 Above all, BMW were ringing in the age of carbon fibre in Hall 11. But the unsung hero on the carbon front for us was a German research institute. Enrico Ladusch is visibly proud of his car. 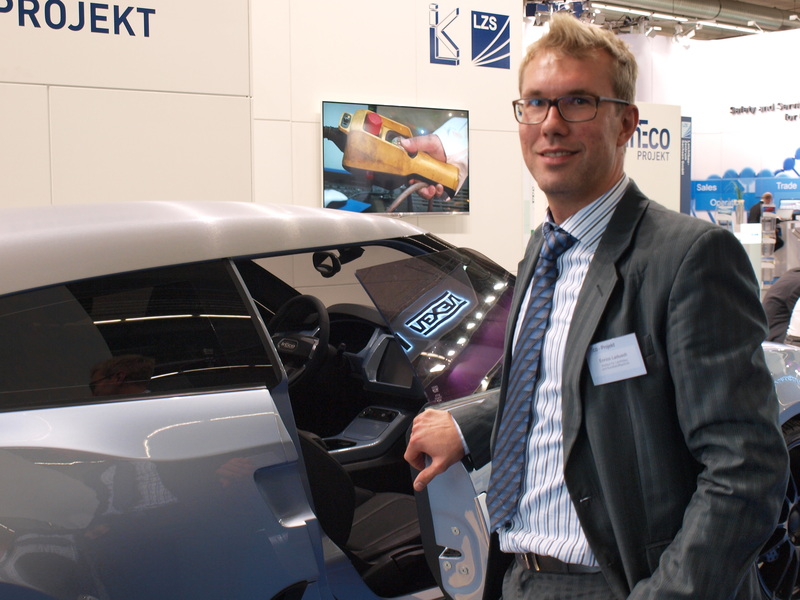 An engineer at the Institute for Lightweight Engineering and Plastic Technology at the Technical University of Dresden, he has been involved in the development of the Ineco Project. 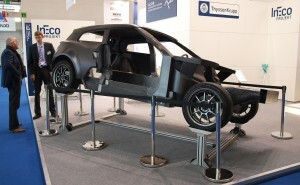 In Hall 4, the Dresden scientists, in collaboration with their research partners ThyssenKrupp AG and the Lightweight Engineering Centre for the State of Saxony, presented an electric vehicle, which, thanks to the carbon-fibre reinforced plastic (CRP) with a steel core, weighs in at just 900 kilograms. In achieving this, only the front bonnet of this lightweight sports model was made with a hybrid CRP sandwich structure. That also amounts to a saving in weight of up to 75 percent as against standard production front bonnets in steel, without compromising safety or rigidity. “And the best thing of all: the manufacture of the front bonnet is automated and can be achieved in a single process step. In this way, our project is contributing to the establishment of Germany as a leading market for electric vehicles,” says Ladusch proudly, as he explains the individual elements of the project with the confident calmness of the expert. We, too, were immediately impressed by the car. Further back in Hall 4.0 we discovered, at the stand belonging to ZF Friedrichshafen, a MacPherson-strut wheel assembly built using the principles of lightweight engineering. 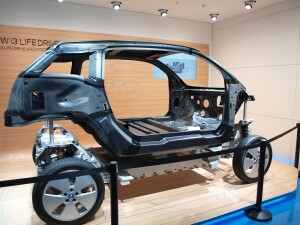 Thanks to the combination of glass and carbon fibres, around 40 percent of the weight can be saved. Unfortunately, we were not able to pick the module up, as a lady with a feather duster urgently discouraged us from leaving even so much as a fingerprint on it. Point taken – no touching! But we are keen to see things like that again at Techtextil. Frenzelit GmbH were hiding upstairs on level 4.1; they are known for their gasket materials and technical textiles. We have already seen high-temperature-resistant needle-fleece fabrics (resistant up to 1110 degrees centigrade), which are built mainly into turbines as heat-shields, but are also used in engine bays and exhaust systems. To return to BMW, however. The Bavarian car makers were displaying their fully electric BMW i3 and i8 in the most modern hall in the exhibition centre, and these, too, showed their dedication to carbon. In the final analysis, a passenger compartment (now called the “life-module”), constructed entirely with carbon fibres enables a sporty electric car like this to break the hundred-kilometre barrier. An information panel displays all the important things we need to know about carbon, including manufacturing processes and a comparison test for weight and rigidity. There were some amusing scenes, as mechanics of the future picked up first a carbon cylinder with a broad grin on their faces, began to sweat a little with an identical amount of aluminium (30 percent heavier) but pretty well needed both hands to lift the steel cylinder (50 percent heavier). The question is now, whether we shall see this in textile research in small runs or in the grand style as at BMW. The Frankfurt Motor Fair clearly showed that the electro-mobility revolution – but not only that – is achievable thanks to carbon technology. We shall certainly be seeing a few more innovations based on this fibre. And we are looking forward to it!